Over the past few weeks, the Bondora team have been working hard to improve the layout of some of the most important pages on your investor account. This week, we will be releasing a major update to a few important sections which we will cover below. 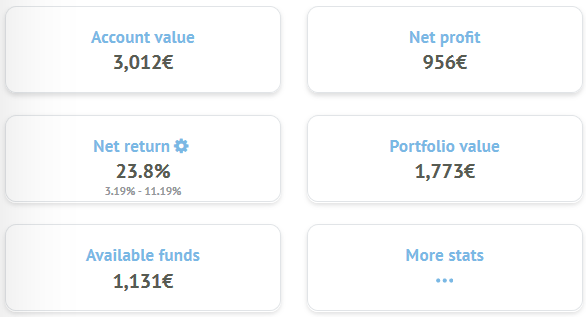 Your Portfolio Manager now has its own separate page on your Bondora account. Here, you can adjust your chosen strategy and use our calculator to get an idea of your expected return based on a starting amount, monthly deposit and timeline. Below this, you will find the ‘Sell loans’ feature which you can use to liquidate your portfolio. For more information on selling your loans, check out our top tip on how to successfully liquidate your portfolio. The Dashboard has been simplified to show only the most important figures for your portfolio and the latest news from Bondora, including our weekly video in English, German and Estonian. A common request we have received from our investors lately is to make the account statement page separate for easy viewing. On your cash flow tab, you will now have the option to turn on the account statement option to do exactly this. One of the best things about this update is that you will now find the Dashboard, Portfolio Manager and Invite Friends tab to be mobile and tablet friendly, meaning you can check your Bondora account while on the go with ease. If you missed the top 5 things we were working on in November, take a look here and see what has changed already.